Starbucks: Get a free, tall cup of coffee at any US Starbucks. No sticker necessary. Ben & Jerry's: Offers you a free scoop of ice cream. Only from 5 to 8 p.m. Store locator. 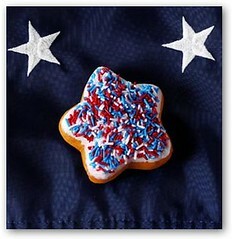 Krispy Kreme: Has a free special star-shaped donut with patriotic sprinkles for voters. Sticker required. Store locator. Chick-fil-A: Giving out free chicken sandwiches. Only at certain locations. Store locator. Arby's: Take a break with a free roast beef sandwich. Store locator. Shane's Rib Shack: Grab a free three-piece chicken tender combo. First 300 customers only. Must have sticker. Store locator. California Tortilla: Receive a free taco. Have sticker. Store locator. Pizza Hut: 20% off online orders. Many local restaurants and shops in your area may also have special promotions so bes sure to check around. You gotta love this! I actually saw quite a number of stores with similar offers around town! So keep your eyes open today.